You’ve all heard the old cliché, it’s a game of two halves. Well this game had three distinct sections. Mexico dominated the first-half, before letting Uruguay back into the tie during the second. Uruguay’s spell of pressure culminated in a minute spell which saw Andrés Guardado sent off, making the match ten v ten as Matías Vecino was shown two yellows in the first-half, and Diego Godín head home from the resulting free-kick. The way Mexico let Uruguay level the tie up was worrying, but the response from El Tri was extremely encouraging. 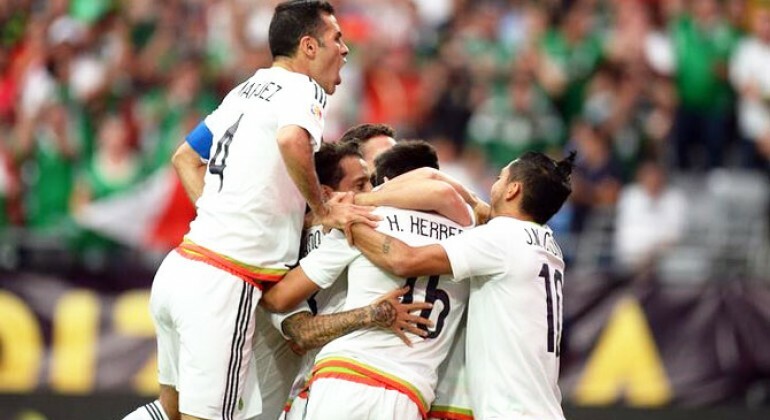 The remaining fifteen minutes was all Mexico, and goals from Rafa Márquez and Héctor Herrera secured a three-one victory. The win and, overall performance, vindicates Mexico boss Juan Carlos Osorio, who fielded an unorthodox but highly effective formation on Sunday night. Here’s how Osorio’s system helped Mexico overcome Uruguay. Perhaps the largest worry for Mexico in the Uruguay match was the threat of PSG striker Edinson Cavani. Cavani, who played up against the centre of Mexico’s three defenders, Rafa Márquez, for most of the game, certainly has the physical attributes to have given Márquez a torrid time. But Cavani was comfortably dealt with, partly due to good defensive work by Mexico, and partly due to the absence of Luís Suárez. Márquez was given most of credit for stopping Cavani from becoming a significant factor in the match, and was awarded the man of the match award, but I think the work of anchor man Diego Reyes was just as, if not more important. With multiple well-timed tackles and interceptions, Reyes stopped the supply line to Cavani, preventing Uruguay’s key creator, Nicolás Lodeiro, from play-making in the process. Reyes also displayed a high level of tactical knowledge and understanding, regularly switching between the centre-back and defensive-midfield positions, to great effect. Uruguay fielded Diego Rolan and Carlos Sánchez on the wings on Sunday, two players that like to drift in from the flanks. Wingers that cut inside can often cause defences problems as they are able to pick up spaces in between full-backs and centre-backs. Therefore, playing with three centre-backs, two of which played quite wide, was an effective way to stop Rolan and Sánchez, as it filled the “inside-forward” space. Héctor Moreno and Néstor Araújo dealt well with Rolan and Sánchez for the vast majority of the match, as neither were able to make a significant contribution before they were both substituted in the second-half. Osorio clearly believes in the talents of his wingers, and focusses much of his attacking moves on the wide positions. Whilst I feel Mexico might have attempted a few too many crosses, many of which were unsuccessful, the amount of chances created from wide areas is a great positive to take from the game. The key to creating in wide areas was normally believing in the skill and talents of wingers such as Javier Aquino, Jesús “Tecatito” Corona and Hirving “Chucky” Lozano. These wingers were often set up with one v one opportunities against Uruguay’s full-backs, and the two Pereiras, Maxi and Álvaro, had a tough evening. Mexico were also able get in behind Uruguay’s full-backs via lofted through balls when Lozano came on from the bench. The Pachuca youngster yet again displayed his outstanding off-the-ball movement. On occasion, Mexico adopted a different strategy, and were able to create an overload in wide spaces. Mexico often had an extra man on the left-wing, with Moreno sometimes pushing forward down the flank, and Guardado regularly drifting wide into the position he regularly played in a few years ago. It was Guardado drifting out to the left-wing that created the first goal, as his accurate cross was turned in by Álvaro Pereira. Often red cards for opposition players are a moment of great fortune, with many coming from rash and unnecessary challenges. But on this occasion, Vecino’s two yellows were fully earnt by Mexico, as both came from good pieces of skill. The first yellow was received after Vecino fouled Guardado, with the Mexico captain passing Vecino with a great piece of dribbling. Vecino’s second yellow, shown on the stroke of half-time, was the result of a foul on Tecatito Corona, who superbly flicked the ball around the Fiorentina midfielder. We’re probably unlikely to see this formation used throughout the Copa América, with Osorio seeming to prefer to tailor his system to the strengths and weaknesses of his opponent. 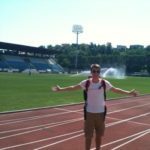 But expect factors used in this tactic to be prominent throughout the tournament, particularly the emphasis on wide areas and freedom for skilful players to express themselves. It will be fascinating to see what Osorio has up his sleeve for the upcoming games in the Copa. 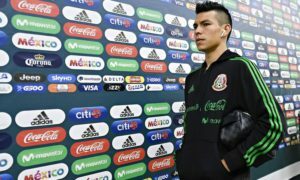 The Colombian has passed his first big test with Mexico with flying colours, and the optimism over El Tri going deep in the tournament is growing by the day.